Since 1996 The Divine Comedy’s albums have been edited in Japan. Mainly because of the success of Casanova. Among them, Promenade was first re-issued in England in 1996 before being pressed for Japan in 1997. The Japanese release of Promenade shows the usual artwork for this album. So it is a (relatively) simple reprint, this one not holding bonus titles. First, the record comes with an obi strip on which appears a logo ‘The Divine Selection’ over a coffee cup (referring to the picture of Neil drinking his coffee in Venice on Casanova), ‘The Divine Selection’ being the name under which were released the four first albums in Japan in 1996-1997 by Tristar (branch of Sony Music), as well as the name of a compilation. On the top in a black frame is the reference number of the record. On the back of the obi-strip is a reminder that the three other albums are available on Tristar, with their serial number. Many notes in Japanese are written around. On the side, the names of the group in Japanese and of the album in English are printed (as for Liberation but not Casanova or A Short Album About Love). 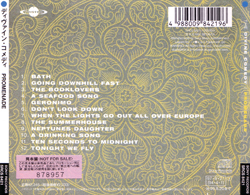 On the back we can find at the same place as the UK release the barcode and the tracklisting. Under the barcode we can read the serial number ‘SRCS 8421’ with the copyright mentions. Up left we can spot a Tristar logo. Down right, there is a Compact Disc Digital Audio logo. The right side is similar to the UK edition but with the Japanese serial numbers on the bottom and a blue round on the top. The left side is different this time: there is a white background with the names of the group in Japanese and of the album in English, printed in black (as on the obi-strip); but still with the serial numbers on the bottom and a blue round on the top. The booklet has the same content than the UK release. On the bottom of each page we find the serial number ‘CS 8421’. On the back, the copyright notice with a Tristar logo appears on the bottom. Finally, the record itself takes up the same artwork, but nothing is printed on the slice. On the sides, appear Tristar and Compact Disc Digital Audio logos. On the bottom, the Tristar serial number replaces the Setanta one, and the copyright mention all around the record isn’t the same. Once unfolded, the sheet that comes with the booklet is made up of 6 pages. The first one holds the tracklisting, credits and an article in Japanese. The following ones are the English lyrics, followed by the Japanese lyrics, credited to Yukako Honda, who was in charge of the fanzine L’Eretico. On the last page appears a couple of mentions, and on the top of each page is printed ‘SRCS 8421’ (not visible on scans). The Japanese releases of Divine Comedy’s albums also turned out in promo version. However, those promos are different than the European ones. It is an ordinary album, and not a CD-R or a CD in a card sleeve. It is indicated as being a promo with the mention ‘SAMPLE’ is graved on the CD slice. A sticker ‘Not for sale’ with the serial number on it is stuck on his back. It seems that each copy has a different serial number, but with the three first digits being always the same (878). Tristar released some adverts to promote the albums in Japan. This ad makes reference to the 4 first albums reissued by Tristar under the name The Divine Selection.